In the wake of the event at SMU on September 23rd a number of Darwinists attacked the speakers and gave misleading reports of the event. We will be archiving all responses to these attacks here. Check back often for updates. More than a century ago, Charles Darwin thought he had explained away the evidence for intelligent design in biology. But now new evidence from molecular biology, genetics, and related fields are raising four important challenges to the claim that complex biological life is the result of an undirected process of natural selection acting on random mutations. 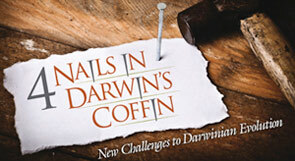 Learn about these “4 nails in Darwin’s coffin” at this FREE event.